I often find myself ordering a goat’s cheese tart when dining out, but as I recently discovered they are not that hard to make at home. And since some of the hard work has been done for me – I’m using Love Gastronome’s caramelized onions, I thought I’d make the tart pastry from scratch. It’s not compulsory, but the pastry is much more crumbly and delicate than frozen crusts. To lighten the filling I’ve used egg whites beaten to soft peaks then folded in. It was more of an afterthought as I realised I may be a little short on filling. But it works perfectly well, creating a light, airy mousse-like consistency. The tarts may not look it, but they are actually very filling and one is enough to satisfy an adult. PS If you’d like to enter my Love Gastronome giveaway, there is still time. Simply follow me on Twitter or Facebook, share the giveaway post and comment on 3 of my current or upcoming posts! If you don’t feel like making pastry from scratch, or are pushed for time you can use frozen shortcrust pastry instead. Recommended preparation order: boil beets, while you prepare pastry and filling. 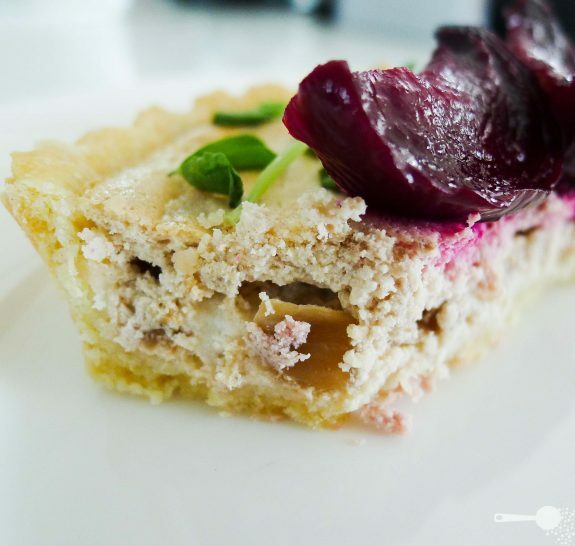 Roast beets and bake tarts at the same time. To make roasted beetroot, cook unpeeled, trimmed beets for 20 minutes in salted, sugared water. Drain, peel using rubber gloves and cut into quarters. Preheat oven to 180C (350F, Gas mark 4). Drizzle beet chunks with a mixture of oil and balsamic, coat. In the meantime, prepare the tart pastry and filling. Once ready, spread beets on a lined baking tray and roast for a further 20 minutes, along with the completed tarts. To make the pastry, sift the flour and icing sugar into a large bowl. Add butter and rub with your fingers until the mixture resembles coarse breadcrumbs. Add egg yolk and the cold water with a pinch of salt. Mix with a spoon until the mixture starts to come together. Shape it into a ball with your hands, cover with cling wrap and rest in the fridge for 10 minutes. To make the filling, beat egg whites until soft peaks form. Mix the cheese, onions, pepper and milk until well combined. Fold in egg whites. Grease 2 small fluted, loose-based tart tins with some oil. To help prevent any tears [tairs not teers], roll out half the pastry between 2 square sheets of baking paper to about 0.5cm thick. Remove the top sheet, gently lift the pastry, turn it paper side up and line the tin ensuring there is no air caught underneath. Remove any overhanging pastry by rolling the pin over the top of the tin. Prick the base with a fork and spoon in the filling. Repeat for the other tin. Alternatively, thaw one sheet of shortcrust pastry then line each tart tin pushing dough into the edges. Prick bottom with a fork. Divide filling mixture between the two tart tins and bake for 25 minutes at 180C (350F, Gas mark 4). Serve warm, topped with roasted caramelised beetroot wedges and snow pea sprouts. This looks delicious! I love this flavour combination. & walnut oil – nice! What a great brunch idea, so easy too!!! This does look very nice indeed! I bought some nice walnut oil in France and haven’t used much of it yet so this recipe would be perfect. Thanks Erin! France = jealous! I use walnut oil in salad dressings, it is perfect as it doesn’t loose the flavour. Question. How much flour in the pastry? Hi, sorry, good pick up! You will need 1 cup less 1/8th of a cup of plain flour. I’ve updated the recipe now. It is a great looking dish and it is in my queue to prepare. Thank you for your followup.